Bees: A Honeyed History by Piotr Socha. Abrams, 2017. 9781419726156. 80pp. G: I bought this for my daughter, whose name is shortened to B.B. 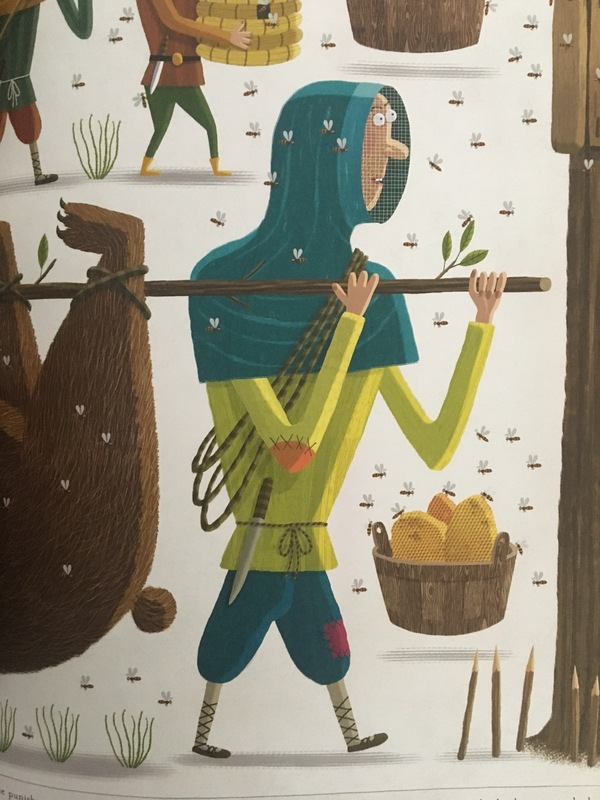 And yeah, those endpapers, looks like the inside of a perfectly laid out beehive, which is nifty, and the illustrations are just expletively great. Apparently Poland produces great picture books, because there’s that imprint, Big Picture Press, that publishes so many in English. (Welcome to Mamoko is one of my favorites. They also published Under Water, Under Earth.) But I was wowed by this book so had to buy it for her. S: It’s cartoony and cute! G: Kinda. But there’s no black lines around the images, it’s more the style of pieces of color being used to create the pictures. S: It looks like Mary Blair‘s work. G: (It does.) Honeybees have been around for millions of years — they coexisted with the dinosaurs. This two-page spread describes what they were like, apparently they were more like wasps, before they started getting food from plants, and at that point they got hairier so it was easier to transport pollen. (turning page) This is a huge and beautiful picture of a honeybee. S: That is so great. G: Queen, drone, and worker, in scale. Honeybees have four wings, which I hadn’t realized. And very gruesome looking horror mouth parts. The basic layout of this book is there are two-page spreads with, across the bottom 1/10th, some bit of text about the images above. On the anatomy page there’s some content about that, including that their wings beat 230 times per second and that they can reach a speed of about 20 mph. G: And why you can’t run away from a determined bee. Here are pictures of the hive, doing different things in there, and how the workers raise a queen. And then a honeybee mating picture — they do it in the air, as the queen is trying to fly off to establish a new hive! G: Most of the eggs are fertilized during this mating flight, and those become workers, or new queens if they’re fed royal jelly. Unfertilized eggs hatch in to drones. G: There’s a little bit about the waggle dance, swarms — the image is so complicated and layered I can’t imagine anyone creating it without a computer, but I’m probably wrong — there’s a complexity to some of these images that reminds me of medical illustrations. There’s some info on biomimicry, pollination (including other pals that pollinate, like the death’s head moth), small bees, cave people, ancient Egypt (where they kept bees in nifty, stackable clay vessels), the diet of the Greek gods, and then here’s dead Alexander the Great, who was transported home in a huge pot of honey after he died (to preserve him). There’s a lot on Slavic cultures, and more on the Polish culture than I’d normally expect to see in a book on bees, because of the book’s origin. 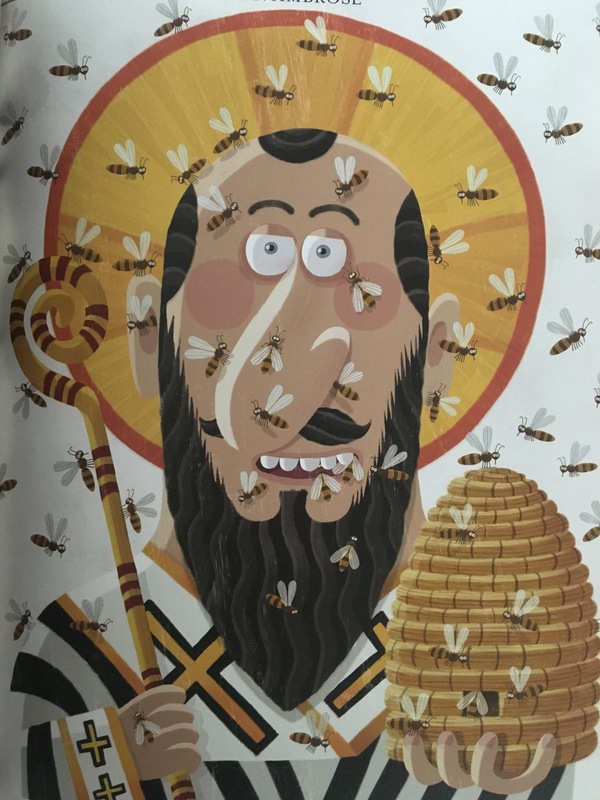 St. Ambrose is the patron saint of bees! And Napoleon and Josephine changed the fleur de lis to a golden bee design, to wipe away all traces of the kings who’d ruled France before him. Here is a fake newspaper broadside with miscellaneous bee facts. S: Way more text on that page. G: Some bits on domestication, and then beekeeping through the ages. Weird Polish history note: beekeepers were held in high regard, and in medieval Poland they had a lot of power, including being able to sentence people to death, which was the punishment for anyone who stole bees. Beekeepers may be your next cosplay. S: The medieval beekeeper uniforms are fantastic! G: Bee hives people make (including old styles from other cultures), beekeeping equipment which is fascinating if you’ve never seen it, and then the crazy thing — people make beehive sculptures (in Poland!). G: … and St. Francis, Adam and Eve, demons, soldiers…the list goes on. This is my favorite page in the book. I need to see if my friend Dave, who keeps bees, can build something like this.